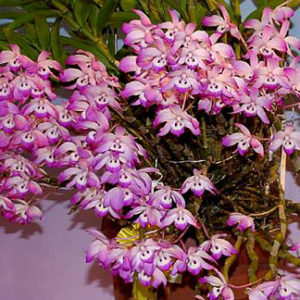 Dendrobium is a huge genus of orchids that is epiphytic or occasionally lithophytic. 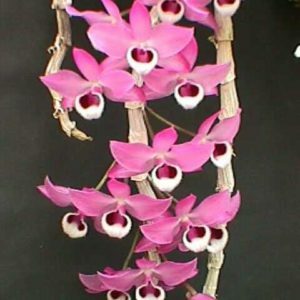 Dendrobiums have adapted to a wide variety of habitats, from the high altitudes in the Himalayan mountains to lowland tropical forests and even to the dry climate of the Australian desert. 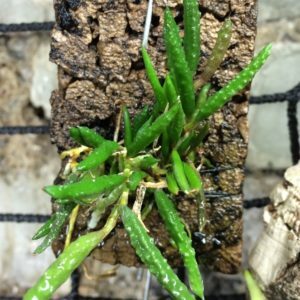 They also come in very wide range of sizes from tiny miniatures like some Dendrobium moniliforme to giant species like Dendrobium spectabile (which we don’t carry, but it’s really cool!). Most (but not all) Dendrobiums prefer moderate to high light, but not direct sun, and most are tolerant of a wide range of temperatures. 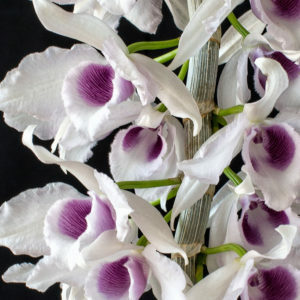 The Japanese Dendrobiums, D. moniliforme, tolerate temperatures from the 90’s down into the teens! 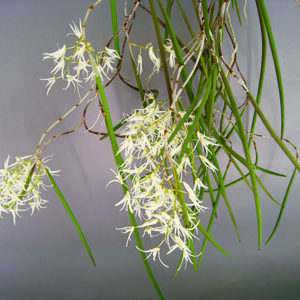 Most Dendrobium species, notably the nobile types such as D. moniliforme, need a cool period that often includes a slightly drier period as well in order to bloom. Without the temperature fluctuation you will get great growth but poor to no blooming. If you are an indoor grower, try to give your plant at least a month of outdoor time to make sure your orchid gets the temperature cue it needs to bloom. 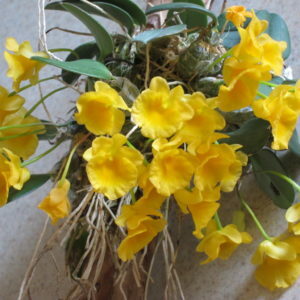 Dendrobiums will tell you how well you are watering if you look at their pseudobulbs. 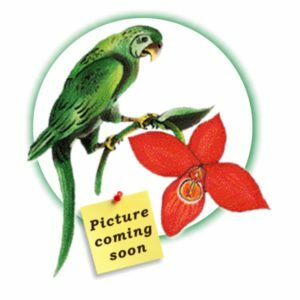 In the winter, it is okay for them to become slightly shriveled–it means you are being sufficiently cruel to ensure good blooming in the spring. In the summer, water like mad and give them plenty of fertilizer. 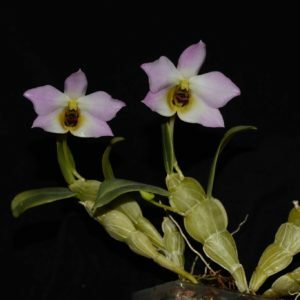 The New Guinea Dendrobiums, however, are a different beast (remember there are more species of Dens and Bulbophyllums than any other genera of orchids). Check out this article from AOS for more guidance.